Looking through old books on microscopy and microscopic life, one is in awe of the beautifully detailed drawings that grace their pages. If you have ever tried to draw pictures of moving animals you will appreciate the difficulties that the early artists were confronted with. Did they draw them after first killing them?, Did they employ thick, viscous liquids to slow them down?, Did they use narcotics to anaesthetize?, or possibly a camera and take a photo and then later trace it? I think that they used an accessory called a compressor, compressorium or live-box. This is an instrument upon which is placed a drop of sample which is then compressed and examined using a microscope. An early simple type of compressor was termed a live-box of which Varley's is an example. It consists of two circular pieces of brass tubing, one sliding over the other carrying a disc of glass fitting over another glass with bevelled edges to prevent the fluid flowing away. The pushing down of one tube over another produced a rather coarse method of compression and one which possibly squashed more animals than was necessary. Other compressoria included a fine vertical adjustment usually via a fine screw thread as well as lateral movement of the top cover glass to aid in cleaning as well as to make it easier to place a drop of sample onto the lower glass. A lot of work went into making sure that both glasses were kept parallel to each other. Examples of a single column allowing such fine vertical and lateral movement include: Ross, Rousselet, Nachet, Graham and the Taylor Microcompressor (which is still manufactured today). Viguier's compressorium used a similar principle except that the operator used a conventional slide topped with a cover glass. Four fine pins press down onto the cover glass via a fine screw on the column. 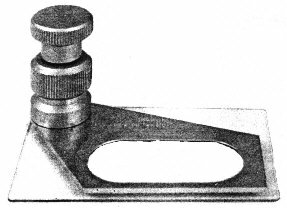 Other makers have devised some interesting examples and the Beck Parallel Plate Compressor is a fine example of keeping both the top and bottom plates parallel. It was also intended to be used on both sides allowing all-round examination of specimens. M.I. 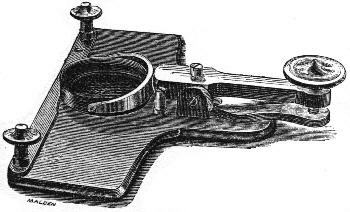 Crichton devised a similar parallel plate compressor to hold two microscope slides so that insects could be examined. Schieb, Jung and Highley's compressors relied on the top cover glass being held in a universal joint to keep the glasses parallel. Other types have been made in the past and it seems strange that only one type (the Taylor Microcompressor) is the only one still manufactured today. Compressoria were popular in the 19th Century but I suppose the advent of photographic techniques to 'freeze' the specimen put paid to this cumbersome and time consuming method of examining specimens. Maybe we look at water-life in a cursory manner rather than take notice of structures and therefore do not need such apparatus. I believe that if more compressoria were made and sold today at realistic prices and that more amateurs were informed about these instruments, that they would again prove popular. References. Crichton, M.I. 1955. An Insect Compressor. Journal of the royal Microscopical Society. V. LXXV, Pt. 4, pp.266-267. Highley, S. 1862. Highley's New Compressorium. Quarterly Journal of Microscopical Science. New Series V.2, pp.307-308. Hogg. J. The Microscope, Its History, Construction and Application. 15th Ed. 1898. Martin, J.H. 1878. A Manual of Microscopic Mounting. Pp.34-36. Taylor, H.L. 1993. The Taylor Microcompressor Mark II. The Microscope V.41, No.1, pp.19-20. Jung and Viguier's Compressoria are shown in the Journal of the Royal Microscopical Society, 1855, Series 2, V.5, ppp.136139. Various compressoria are shown in G.L'E Turner. The Great Age of the Microscope. 1989.